Babylonia Bei Dai (“BB Tai!”) So we all know that I really enjoy Babylonia. 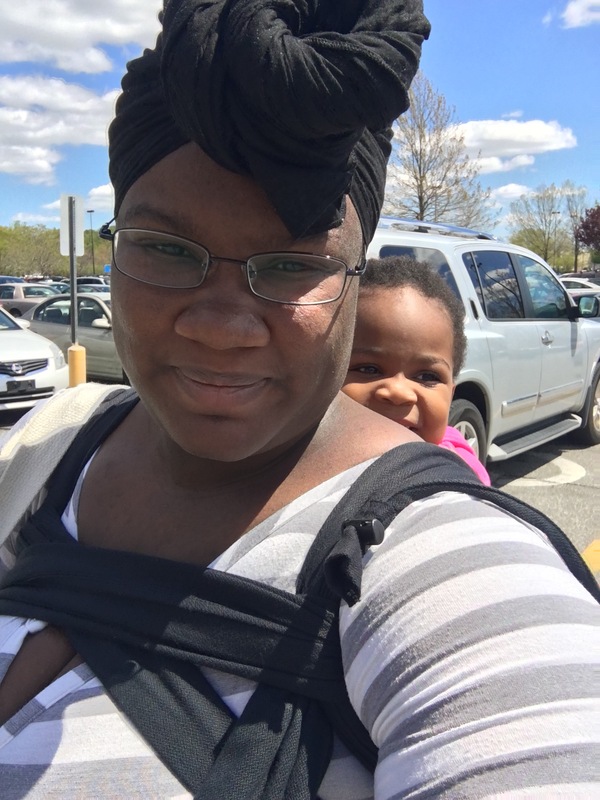 I’ve reviewed the BB Sling AND the BB Slen before. Now thanks to Marsupial Mamas, I got to try the bei dai FINALLY!! I did not get to use the infant insert that comes with it, but now they have a nifty new way to cinch the panel (Jan 2017). Right now, I will tell you about using the Pineapple bei dai with a 30 lbs 3 ft tall toddler. 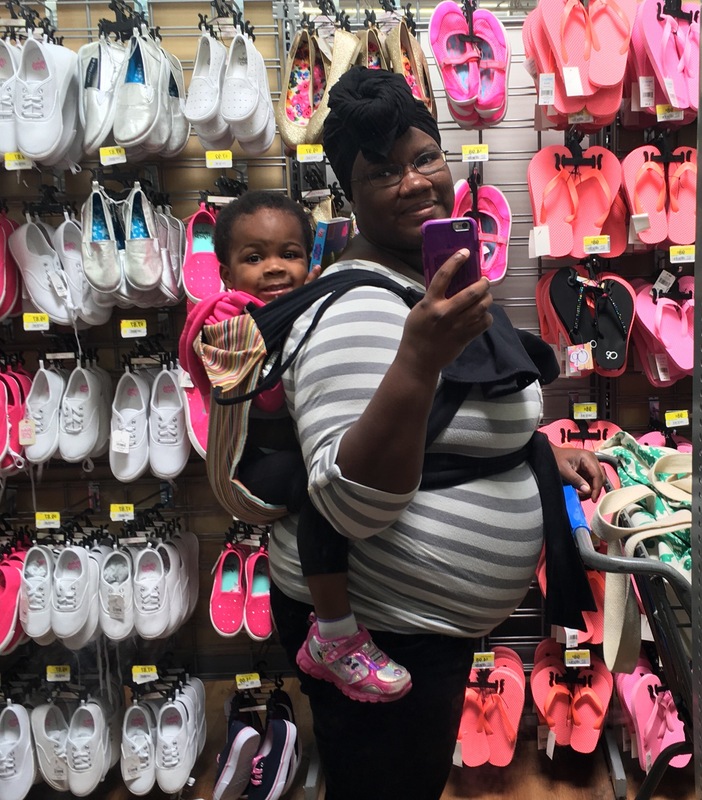 Brittany and Maxine taking a mirror selfie while out shopping at Walmart. Maxine is on Brittany’s back in the bei dai. There are shoes in the background. So, I am 5’5, 250 lbs, and 29 weeks pregnant. I could tie this bei dai off in the back with a front carry AND I could finish it off tied Tibetan. This is a HUGE DEAL. 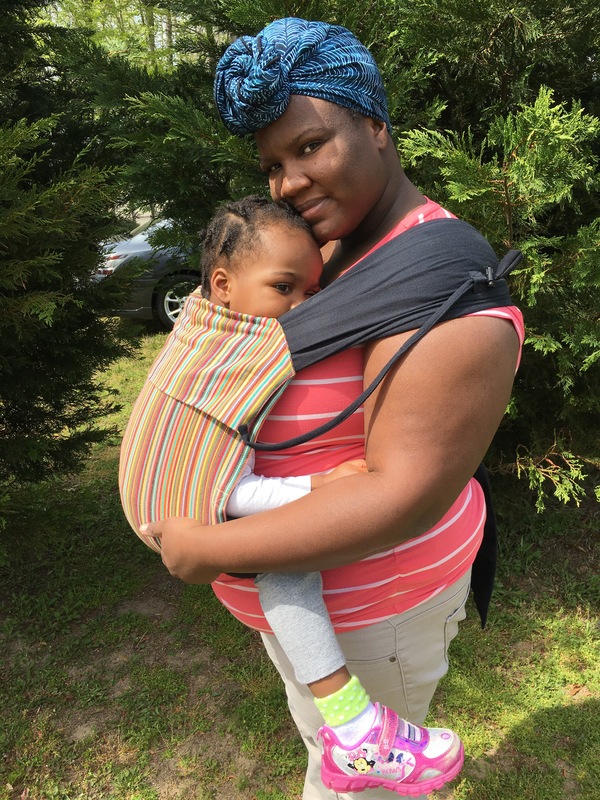 I come across so many carriers that I can’t even buckle or tie off because they are too small and this bei dai just made me feel like it was made for me. Over the three weeks we had it with us, we used it a lot. I mean, look at that fit! Maxine is THREE FEET TALL and it fits her this well! She was so comfy in here. Brittany with Maxine in a front carry facing the camera. Maxine is centered in the carrier and Brittany is holding one of her feet. There are green trees in the background. 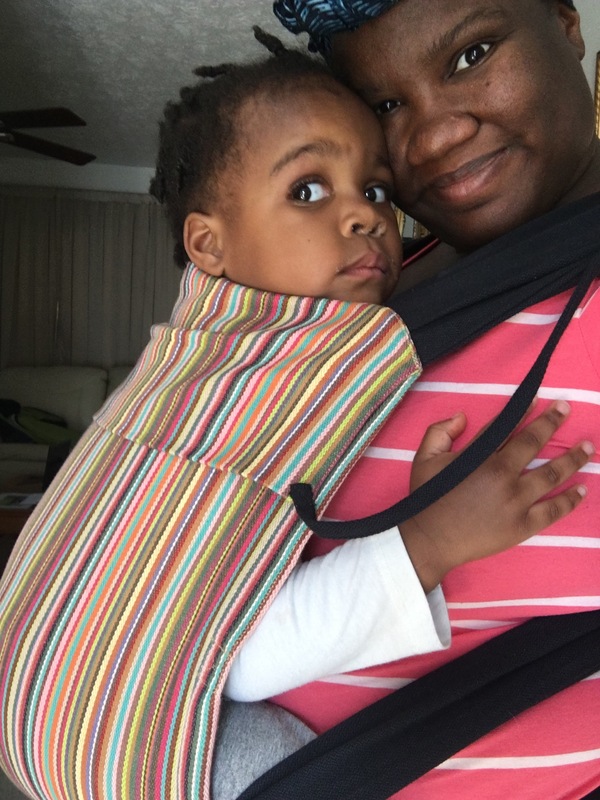 This carrier is made from Babylonia BB Slen fabric. The panel is Pineapple and the straps are Black Beans. There is not any padding, but it is pretty comfortable because of the wrap straps that are able to be spread. We did mostly back carries with the bei dai because front carries are not as comfortable right now with my bump in the way. The front carries we did do though? Very nice. I know that without my bump it would be very comfortable because the carrier sits where I normally like it. Back carries were a dream! We back carried in the Babyloni Bei Dai daily. Brittany and Maxine taking a selfie on a bright day. The sky is blue and Maxine is looking off into the distance. Brittany is looking at the camera. 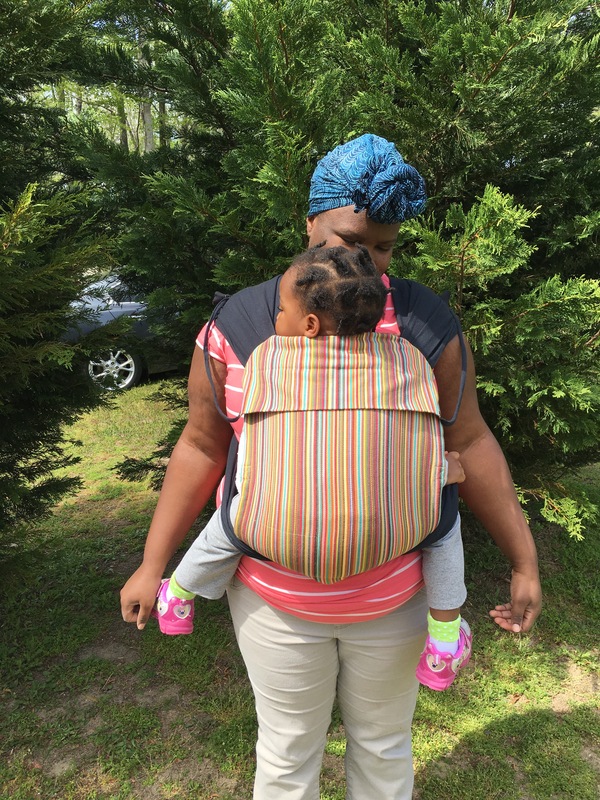 I think this carrier would be great for all babywearers and from little babies up through toddlerhood! The infant insert makes it useful for small babies. It looks pretty neat! If you love bei dais, you will DEFINITELY love this! It’s more comfortable than the Fidella Bei Dai (“flytai”) in my opinion. Brittany and Maxine taking a selfie. Maxine is on Brittany’s front in a multi-colored bei dai. Maxine is looking past the camera and Brittany is smiling into the camera. You can purchase the BB Tai here. A very tired Maxine is on Brittany’s front in a multi-colored bei dai. Brittany is looking into the camera and Maxine is looking past the camera. There are green trees in the background. Be sure to check out Babylonia on Facebook and Instagram! Also, follow Marsupial Mamas on Facebook and Instagram, and be sure to join Marsupial Mamas Neighborhood for all kinds of fun and to hear about sales first!